PTCL has come up with the all new Double Impact packages which offer a bundle package of capped voice minutes and data services. Double up Unlimited packages were launched in August 2009 to promote Broadband and PSTN with double play offering. 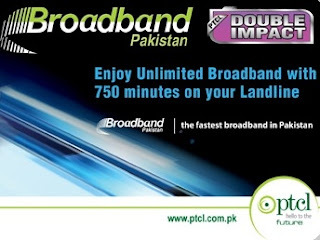 Key Highlights: Unmatched voice quality at lowest call rates, Double Impact offers more value for money, PTCL Broadband offers service is available in over 1000 cities and towns across the country, Seamless experience when streaming HD videos and downloading movies, TV shows and music files etc, Access to free movies, music, classical Pakistani plays, famous cricket matches, educational and religious contents exclusively for PTCL broadband customers on ‘Buzz’ broadband web infotainment portal. * For quality assurance purposes and to provide uninterrupted service to all customers Rs.1000 per month will be charged for greater than 50 GB downloads. This monthly limit is applicable on 4 Mbps, 6 Mbps & 8 Mbps packages.